The cruises begin near the Charles University Faculty of Law at Pier Number 6 (the nearest tram and metro stops are at Staroměstská). 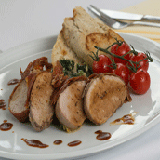 Both buffets and meals to order are available, the choice is yours. Passengers will also be treated to a wide variety of alcoholic and nonalcoholic beverages. The boat even comes equipped with a lava grill on the upper deck for all your grilling needs. Passengers may also request either live or recorded music to enjoy their food by. In addition to the wonderful dining experience, you and your friends will be able to soak in and enjoy the majestic sights along the Vltava River, including the wonderfully lit-up Prague Castle, Kampa Island, and famous Charles Bridge. Dinner cruises are truly a unique experience, sure to provide you with lifelong memories. 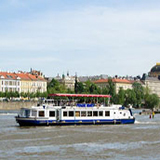 The lovely one-hour boat cruise of the Vltava River begins near the Charles University Faculty of Law at Pier Number 6 (the nearest tram and metro stops are at Staroměstská).